Class groups are divided by age initially to ensure children have the opportunity to develop with their peers. 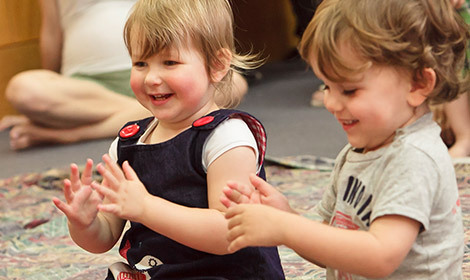 As small babies begin to discover their fingers and toes and develop control over their own movements we can encourage this journey of self-discovery and development through touching songs, games, rhymes and chants. We can also reinforce a baby’s efforts to talk to us and therefore foster the development of language and singing by playing simple echoing games and again through simple songs and rhymes. Patting, rocking, walking and gentle bouncing are all very natural ways in which we can begin to reinforce the concept of beat and the pleasure of music to small babies. 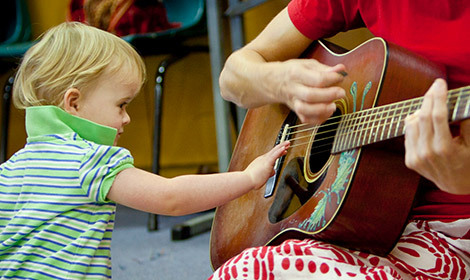 From one year, your child can begin to participate in action songs and rhymes. They can clap hands, bang and shake different percussion instruments and move to all kinds of music, experiencing different styles, tempos, pitches, rhythms and dynamics. From the age of two, through movement, games, songs, and playing simple rhythm instruments, you can slowly start to instil both an understanding of the concept of beat, and an ability to play along to the beat. 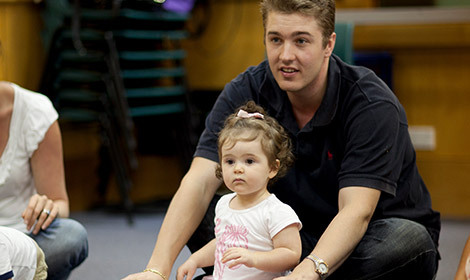 Your child will begin to synchronise music through movement and playing rhythm instruments. The concept of rhythm as opposed to beat can be slowly introduced through body percussion e.g. 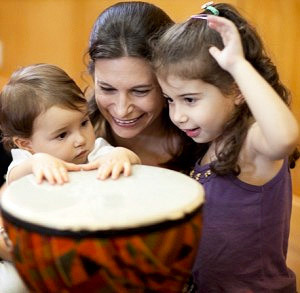 clapping and simple instruments to express the pattern of the words in songs, rhymes and chants. By three years of age your child will be singing very simple songs and phrases with some accuracy, as they gain greater control of their voice and their ability to change to pitch, dynamics and tempo. 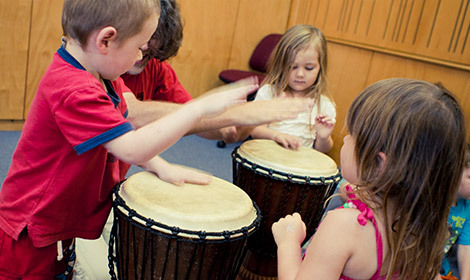 As their ability to hear, move and play to the beat improves, they can also begin experimenting with simple rhythmic patterns. A three year old can express himself by making up his own little songs and moving freely to music. At four the world of music will really begin to open up for your child. In some venues we may not be able to run classes to the specified age groups defined above. This may be because there are not enough children enrolled in one age group, because it is a new venue and we do not have enough enrolments to run three age-specific classes or because we are experimenting with different age mixes. In these cases, the lesson plans will be designed specifically for the children enrolled in the class. The blend of age groups in these classes have proven to be very successful as the younger children learn from the older ones and the older ones enjoy being mentors. Most Junior and Preschooler classes tend to be mixed as well as younger siblings are welcome to attend the same class as their older sibling.